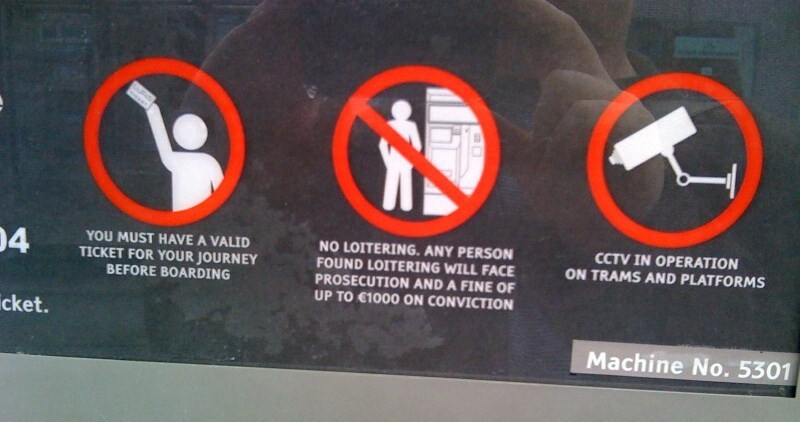 Only just noticed this today: it’s illegal to loiter at Luas stops. Jesus Christ, you can’t hardly win, can you? Hmm, not general loitering, Eoin. Seems it’s the kind where you stand to the left of the machine, with your hands in your pcckets. Hard to tell if he’s saying anything. Would advise against saying “change?”, anyway. This is all negated of course if you hold your ticket in the air, perhaps screaming “Bingo”, as in Fig 1. Agreed. You’re not loitering if you have a ticket. Nah, what about those of us who use the Luas but regard the whole buying a ticket thing as something of an optional extra? a serving suggestion if you will? That’s a worrying thought, EK!